Brainard Fowler Smith was born in Madison, Indiana, on 4 July, 1849, to Samuel Fowler Smith (1808-1879), a merchant and Belvidere Roberts (1819-1866), a Yankee school teacher from Vermont. Samuel Fowler Smith (see the nearby photo from 1870s) was a remarkable man. Born in the Yorkshire village of Walton, England, on 22 Dec. 1908, in 1835 he decided to follow his 2 older brothers, who already immigrated to US and landed in New York on 3 Nov. 1835. 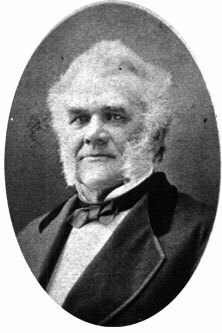 Spending some time working as a shoemaker (in England he use to work in a shoe shop and as a shoemaker) in Cincinnati, Ohio, and then seeing his relatives, he settled in Madison, Indiana, and set up his own shoe business, and a choir and singing school. In 1844 he married to the 24-year old Vermont-born Belvidere Roberts, and soon they had 3 children, but only one of them, Brainard, survived, moreover with everlasting health problems. In 1851 was born another son, Charles R. Smith. The family remained in Madison until 1855, when Smith moved to Indianapolis to enter a partnership with Judson Ostgood to make lasts and pegs for shoe making industry. Later they established a highly successful business for carriage wheels, and the establishment was at that time the largest manufactory in the West. After the death of his wife in 1866, Smith married to Lizzie Sinclair and they had one child. Samuel Smith died on 12 March 1879. Brainard Smith obtained one year of his preparatory education at Knox College, Galesburg, Illinois, of which his uncle, Rev. Henry Curtis, was president. His second collegiate year was taken at Wabash College, Crawfordsville, Indiana. He entered the freshman class at Yale College in 1866, and upon the death of his mother he returned home and afterward finished his collegiate course at Indianapolis. After graduating Brainard Smith entered the office of his father's factory and remained there until the ensuing autumn. Hearing a great deal of California, his curiosity was excited to spend a winter here. Carrying out his contemplated programme, he liked the climate so well that he has ever since remained here. In 1871 he came to Sacramento with E. E. Ames, who was agent for the Studebaker wagons and for his fathers patent wheels, and remained with him first as commercial traveler and afterward as business manager until 1879, when he went to San Francisco to assume the management of a large agricultural house there. Filling that position until 1883, Smith returned to Sacramento and opened a house of his own, under the firm name of Brainard F. Smith & Co., the partner being George A. Davis, of San Francisco, in 1885, caused Mr. Smith to close his business. Since that time he has devoted his attention principally to the collection and settlement of his old accounts. Since August 1, 1888, Smith has been secretary of the Folsom State Prison, and May 2, 1889, he was elected the secretary of the Preston School of Industry, to be located in Amador County. He has taken an active interest in politics as a Republican, having identified himself with almost every political movement. Smith remained in the office of Folsom Prison and then in the San Quentin Prison until his death in 1908. Brainard F. Smith was scarcely five feet in height, one leg much shorter than the other, and he walked with two canes, rarely resorting to the use of crutches. He at all times was one of the best-dressed men in the community, and always wore a silk hat. Deformed and crippled as he was, no one ever heard him murmur or complain, and he was the life of every gathering of which he was a member. He wore diamonds, and always had money. With the latter he was very liberal, and did much for charity. His poor little emaciated and distorted frame encased a heart as bug as that of a bullock, and he had a brain and intellect equal to that of most men. Brainard Smith married to Mattie Pinkham on 5 October, 1892. They had one son, Caryl Leigh Smith (born 29-Jan-1894, died 2-Sep-1959). Besides the two patents for adding machines from 1886 and 1887, Brainard Smith had another patent for a pipe for smoking (US596832) from 1898. Brainard Smith was a member of Sacramento Masonic lodge No. 6 Order of Elks. Brainard Fowler Smith died on 30 August 1908, in San Quentin, California.